The North East’s own The Shooting Of…, aka Paul Jeans, performs earnest alternative pop, with hands tinkling the ivories of his piano and his heart firmly on his sleeve. The Sky Is Full Of Lights is shrouded in dark clouds but the infectious melody keeps it from ever getting eerie, whilst Captain Of My Soul, also taken from Jeans’ 2016 album Analogue Heart, is steeped in soulful delights. The multi-instrumentalist alternates vocal delivery through a copperphone microphone which keeps things fresh, and newer tracks like Drifting On That Wave suggest more positive vibes, with the jaunty set highlight Chemicals as addictive as the prescriptive medications it references. A fine set which suggests plenty of promise for musical ventures to come. 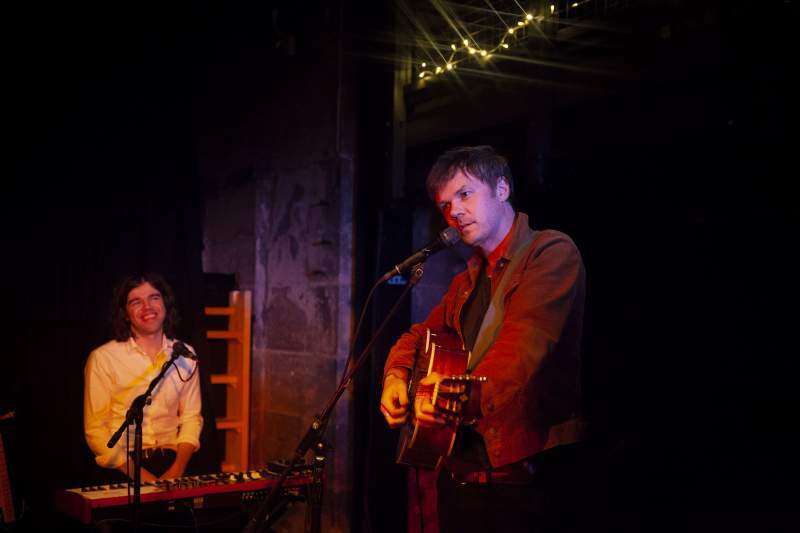 It seems a far cry from the bratty chaotic world of Idlewild as Roddy Woomble steps onto The Cluny 2 stage armed with just an acoustic guitar and keyboardist Andrew Mitchell in tow. Only the hints of grey in the hair suggests Woomble has aged and – though the folksy opening track Floating On A River, from last year’s The Deluder album, suggests a more mature songwriter at work – you have to pinch yourself to remember that 12 years have passed since the Scottish singer released his debut solo album My Secret Is My Silence; the title track he plays so soulfully here tonight. Unafraid to delve into the past of a band that are still an ongoing concern – an as yet unrecorded track is aired tonight – anthems like You Held The World In Your Arms and Little Discourage are transformed from big pulsing rock numbers into delicate acoustic refrains, proving that these songs Woomble has crafted work no matter the format. Roddy was often happy to stand to the side of the stage and watch in admiration of his backing band when he last played the North East with a show at Sage Gateshead, but he is incredibly relaxed and comfortable playing the part of sole guitarist here tonight, with Mitchell’s wonderful work on the keys no doubt enabling that role. He’s playful too; “He’s the backing singer though, eh?” Roddy quips when a member of the audience asks if Mitchell’s mic can be turned up. Informed that Waverley Steps was played at a couple’s wedding he wondered if they realised it was about some “Dirty, covered in piss, steps at a railway station.” Despite playing to the audience, these songs are indicative of the fact that solo Roddy is a more romanticised version of the formerly cynical Idlewild frontman. Idlewild’s breakthrough song American English always goes down well, as does the simply breathtaking The Remote Part/Scottish Fiction; the amalgamation of folk song and poetry that never fails to raise the hairs on the back of the neck. Finishing off with a fine cover of Billy Fay’s Be Not So Fearful, Woomble’s humble showmanship is belying of someone who has crafted so many great songs and it’s always a pleasure to see him cross the border.